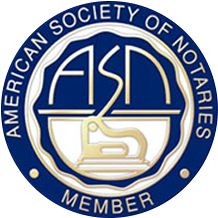 Since our inception in June of 2000, New Jersey Mobile Notary Service has specialized in document notarization services throughout New Jersey. Our coverage area includes Bergen, Passaic, Hudson, Essex, Morris, Union and Somerset counties. Upon request, we will travel anywhere in New Jersey. As mobile notaries we will travel to your home or office saving you time, money offering convenience and professional service. New Jersey Mobile Notary Service takes great pride in being available 24 hours a day, 7 days a week, 365 days a year (24/7/365). We will travel anywhere, anytime to meet the needs of our clients. This includes evening, weekends and holidays. Our company employs 10 mobile notaries and we are able to respond to your request immediately and on many occasions arrive at your location within 2 hours. For a reasonable travel fee which will be negotiated prior to our arriving, you can schedule an appointment with us at a time of your choosing and a location that is convenient. We have built a solid reputation based upon our experience and professionalism. Our demanding clients choose us because they know their documents will be notarized correctly in accordance with the Notarial Rules and Regulations of the State of New Jersey. Professionalism, discretion and reliable service are our goal. David Lever is an attorney licensed in New York and New Jersey. Over the years, he has represented clients in all facets of international law including major corporations and individuals. He is very familiar with document certification requirements (apostille and legalization) domestically and internationally. Maurice Hallivis has over 7 years experience as a financial advisor on Wall Street, and 4 years as a Commercial Real Estate Broker. He has authored 2 books on Proper Notary Practices and a Study Guide on passing the New York State Notary exam. Please view the About us and Accreditations Section for more information on our principals. New Jersey Mobile Notary Services’ office is located at 45 North Broad Street, Ridgewood, NJ 07450. Mobile Notary Services has its corporate headquarters located on the entire 4th floor at 22 Park Place in downtown New York city. The office serves as the “nerve center” of our base of operations for our New York, New Jersey and nationwide operations. Unlike our competitors who are mom and pop one man shows communicating on cell phones in between jobs, our in house staff assists in managing over 50 assignments a day efficiently and seamlessly. Since our inception in June of 2000, New Jersey Mobile Notary Service has specialized in document notarization services throughout New Jersey. Our coverage area includes Bergen, Passaic, Hudson, Essex, Morris, Union and Somerset counties. Upon request, we will travel anywhere in New Jersey. New Jersey Mobile Notary Service was started in June of 2000 (18 years ago) because we could not find a notary public to notarize a lease agreement. We figured other people throughout New Jersey would benefit from our “notary on call” service and this has proven true. We take great pride in our impressive list of satisfied clients. Also having a positive impact on people lives and assisting with adoptions, job applications, contracts and real estate purchasing is truly rewarding. Corporate office space in Ridgewood, NJ in the heart of Wall Street and a dispatch center in Midtown so we can be at any location as quickly as possible. We have expanded our services to include New Jersey, New York and Washington DC and are currently negotiating for space in Connecticut. As our company grows we remember the importance of always being the best at what we do.